"Their sadness turned into gladness..."
The tornado took out everything in its path. It leveled homes, crushed dreams, lives splintered by heartache and despair. Loved ones hurt, missing or gone. How could these hard hit areas ever survive? People kept asking where was God in all of this chaos. We waited patiently for the word we could travel down Crescent Ridge Road...not too far from our home. William seated in the backseat, holding onto the precious cargo: his stuffed teddy bears. He was very quiet and spoke only a few words..."God, help them." I had made a pact with William. If at any point he got scared, we would turn back. And so, we began our journey through a war zone of sorts; much worse than I ever imagined. Everything decimated...rescuers at every turn. Voices yelling, trees and debris being lugged off of homes and cars. And yet, lining the streets people walking in water and food... giving it out to anyone in need. William spotted 2 little girls...their home damaged by the storm. Making sure there were no wires out of the way, William carried them a teddy bear a piece. "There you go. I'm praying for you." He smiled at the parents and made his way back to the car. Another family was spotted. When William gave little boy and girl the teddy bears, he hugged the children. The parents met William on their driveway. 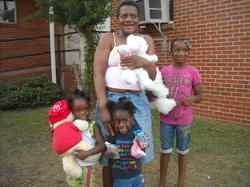 The mom reached out and took William's hand in hers..."Their sadness turned into gladness when you gave them these toys. Thank you." Not only have the children in this community been helped, but children in these areas: TUSCALOOSA COUNTY- HOLT, ALBERTA CITY, CITY OF TUSCALOOSA, ROSEDALE, FOREST LAKE, BROOKWOOD, HACKLEBURG, WEBSTER'S CHAPEL, HOMEWOOD, PELHAM, MCCALLA, VANCE, PRATT CITY, COALING, CLAY, TRUSSVILLE.